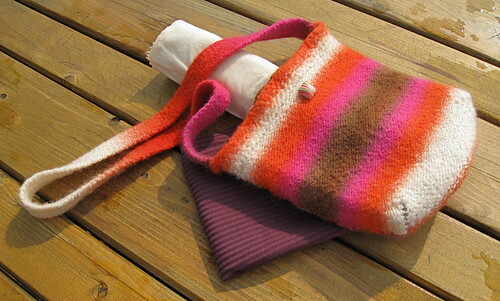 I recently finished felting my Rowan Bag (PDF pattern link) and it turned out wonderfully. I was stressed about getting a skinny deep bag that wouldn't be very useful. I love the rounded bottom. The bright stripes are going to make it a perfect summer purse. 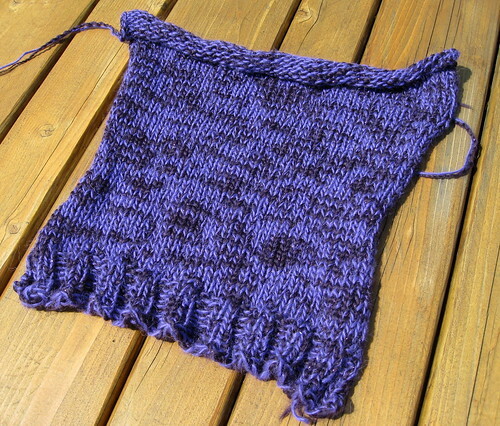 Now that I know I'm going to use it a bunch, it's time to line it with some pockets and add a button-loop closure. And it's back to the skinny-yarn sock! I've been working hard on this for the past couple months. I want to have one sock to prance around in. Now that I can see the heel outside of the loom area, it seems to be going faster. I do wish my feet were smaller though. 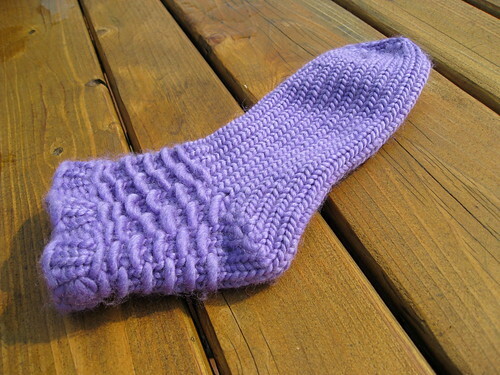 I'll probably pull a "Barbara" ;-) and knit with some different sock yarn for #2. They don't have to match and I want to play with some new sock yarn. Speaking of projects that take forever, I feel like I've had this yarn that long. I forged ahead with my V-neck sweater. 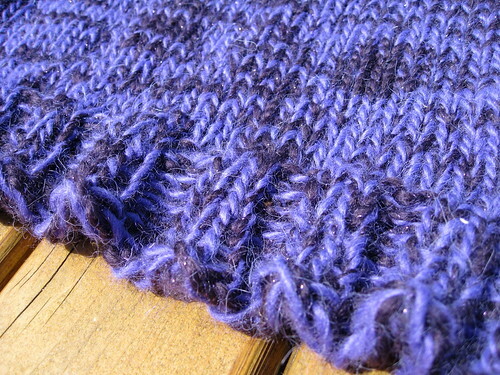 I paired a light purple alpaca (from Zoe) with a dark purple sparkly soy/wool-blend yarn (from last year's Stitches). Since the dark yarn is a thick and thin, the yarns together create a marbled knit effect. But I discovered a significant downside of switching the twisted-knit stitch (e-wrap, single stitch) to the flat-knit stitch. The back of the sweater covers about half my back. The pattern is labeled as a XL so it should otherwise fit. The length is perfect! So here's my crazy plan. 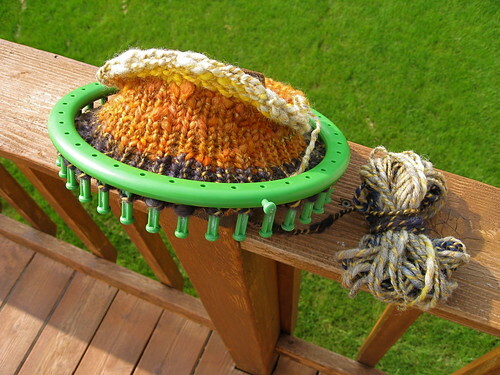 For the back, I'm going to knit another panel just like this one. Then I'll seam them together and cross my fingers that a middle seam won't bug me back there. For the front, I'll make the knit panels in the same size. But I will add some ribbed edging on one side of one. When those get seamed together, I will overlap the front seams and make a fake button band as a decorative element. And when I overlap, I can fit the sweater to my liking because I'm sure I'll have a couple inches to spare. Am I nuts? Here's hoping the arms go a bit more smoothly! Maybe the color purple is cursed for me. What a terrible thought! I'll never think it again. But here is a sock who will never have a mate. I tried a wyif (work yarn in front) pattern for the leg and that part was fun. 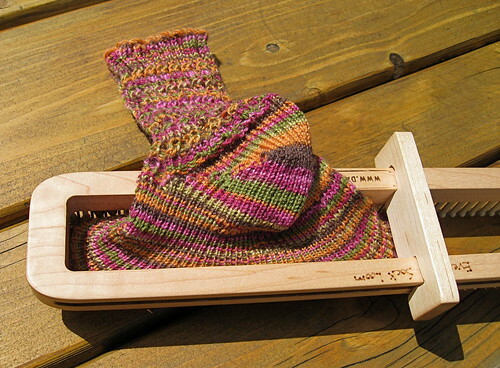 In the end though, I learned to never, ever try knitting a slipper sock with a roving-like yarn again. NO stretch. Plus the yarn started to break during the kitchener toe. He will hang on my loomy wall as a reminder. I haven't forgot the shop in all this. Here is a peek at a drawstring bag I'm making for you. I had 50 yards of some gorgeous handspun yarn by Traveling Rhinos. I've loved it for two years but never could think of the perfect pattern for such little yarn. The wool is a bit too rough for items that touch the skin. But a resilient little bag? Perfect match! Watch for it soon. I have one more WIP and FO but they are secrets so shhh ... they will just have to wait.